I love seeing main stream toy releases that have the audacity to put a sticker on their box touting them as limited edition followed by a number that's in the tens of thousands. Proudly they shine with metallic luster proclaiming that only you and 25,000 of your closest friends could possibly be the lucky owners of this figure. Most stadiums can't hold that many people at one time so the idea of being hard to find is kind of laughable. You wanna know limited? How about three, as in only three people that are currently alive or that will be born before the release date can ever own one of these. Those are numbers that inspire fights and a lifetime of envy from anyone who misses out. Nate the Milkman is not an actual milk man as far as I know, but he is delivering the goods (see what I did there) when it comes to these custom LaMorrtts. 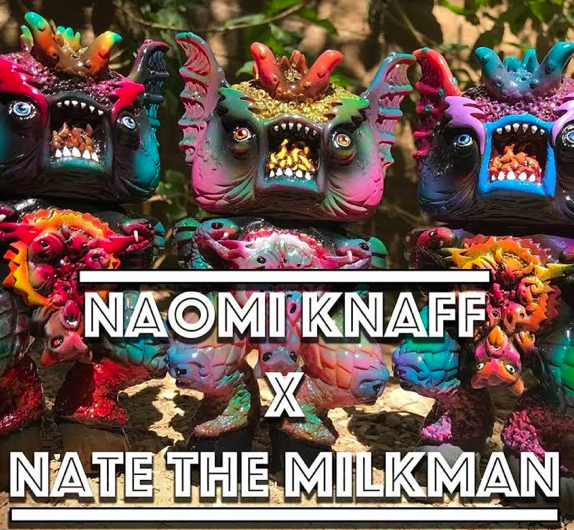 He painted up three of Naomi Knaff's vinyl babies and if offering them for sale via his website today, August 10th, at 5pm pacific time. They will be $120 each and can only be found at natethemilkman.bigcartel.com.